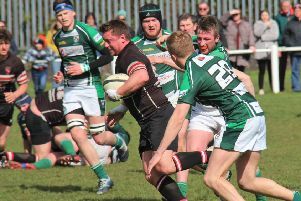 Relegated Old Crossleyans looked as though they would appreciate a drop in grade as they were humbled 54-14 by Alnwick in their final home match of the season in North One East yesterday. Conceding eight tries at Broomfield to opponents who have been fighting their own survival battle until recent weeks is perhaps a reflection of where Crocs are just now. Flimsy defence was their main downfall and while there was no lack of effort, the contest was as good as over by half time when the Northumbrians had built a 33-14 lead. No 8 Ryan Hammond made a surprise return from a leg injury, as he prepares for a playing stint in Australia, while long-serving Chris Seymour was signing off at Broomfield before retirement. The long-distance visitors took the lead with an unconverted pushover try from a scrum after three minutes, blind side flanker Smith getting the touch down. Vine was short with a penalty attempt and the visitors went 12-7 upon 12 minutes when their forwards broke through following a lineout and James Bird converted his own try. Crocs had their noses back in front on 18 minutes when Vine dummied his way through, sped past half-way and when tackled 20 metres out managed to slip the ball to supporting Adam Sutcliffe. Vine added the easy goal. The wheels started to come off for Crocs in the second quarter. Their defence was found wanting and Alnwick’s open side flanker James Hamilton scored twice, with Bird adding both goals. When Bird took advantage of poor tackling to add his side’s fifth try and convert, Alnwick were suddenly out of sight. The third quarter, punctuated by several injury stoppages, was uneventful apart from Vine going close from a tap-penalty. Alnwick continued to look superior in many facets of the game and surged past the half-century mark with converted tries on 62 and 77 minutes plus another in stoppage time. Winger Hugh Todd touched down after Crocs had run out of defenders close to a ruck; No 8 Ben Gothorpe scored try number seven under the posts after supporting a fine break from his stand-off; and centre Frank Hutchinson caused further embarrassment to the home defence when shooting clear following a scrum on half-way.